A Content Management System - CMS - is a system that is used to manage the content of a website. By using a Content Management System - CMS - you are able to update and manage your website content with pictures, text, videos and blogs. 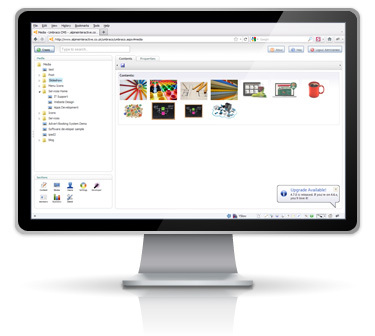 The CMS software sits in the background and is used to produce the content that is displayed on your website. There are several Content Management Systems - CMS - including Umbraco, Joomla, Drupal and WordPress on the market, they fall into two categories, paid for and free (open source). Often the common problem with paid for content management systems is that they aren't transferrable between software development companies. If you use a paid for CMS that is solely owned by the developers, in the unfortunate event that you wish to transfer your website to another web development company, you will have to start your website from scratch again, incurring costs in both time and money. What is open source content management system? Open Source means the programming code behind the product is not locked and is therefore transferrable, allowing you to use a different developer to work on your website. Open source code is generally free to obtain. What is the best Content Management System to use? Of the Content Management Systems that we have mentioned, Umbraco, Wordpress, Drupal and Joomla, all are open source. Umbraco is built using Microsoft's set of tools called a framework. This means anyone familiar with developing in Microsoft's Industry standard language can further develop the product. There are over 125,000 sites (and counting) running Umbraco including hotels (Beverly Hills Hotel), magazines and publishers (Vogue, Condé Nast), pop band 'Take That', Corporations like Tesco, Heinz, Microsoft even runs its website ASP.net on umbraco. Scan Disk, Peugeot, Henri Lloyd, events websites like Car Shows, Davis Cup Golf, law firms, Universities. Umbraco can work with your organisation large or small. We at Alpine Interactive are level Level 2 certified Umbraco developers - this means our developers, have passed the highest Umbraco certification. We are also broader software developers based in London, which effectively means we can write programming code which your average web designer cannot. Our software development skills can really help get the most out of Umbraco, we can develop the content management system to meet your needs, not just stick to the out of the box functions! We have built numerous websites using Umbraco - see our website design portfolio - and further developed Umbraco to interact with charts and share price information and much much more. We have created Umbraco websites for charities, Umbraco websites for asset management companies, film websites, media websites including magazines and media agencies, intranets, student and university selection websites to name a few. What can Umbraco do for you? Umbraco Content Management System saves you time and money, by allowing you to update your website content and not wait for a third party web developer to update your website. Once the Content Management System is setup for you, you simple edit your content and save and publish - it's that easy. If you want to change the order of your website navigation menu - right click and sort - easy. You can preview your content before you publish to the internet avoiding costly errors. Umbraco allows you to create accounts with different permission levels, perhaps you want to be notified and review content before it's published - Umbraco can do that. There is even a plug-in that allows you to update your blog straight from Microsoft Word! With Alpines in-depth knowledge of the programming code and Umbraco's versatility, Alpine can create you a truly user friendly open source content management system. Umbraco is truly adaptable to meet your business needs, Umbraco existing features or templates can be customised or even create your own new features. If you need an ecommerce website, Umbraco has a package called Ucommerce, a shopping basket ready to go. Umbraco provides you with the content management system to create one set of content but roll it out across different platforms giving a truly responsive design and continuity. Alternately you can use Umbraco to manage content and let you present a version of the website for desktop and another version for a mobile application. Now that you know what an Umbraco developed website can do for your business, why not get in touch to discuss your website or software development project and we'll get in touch with an estimate and a handful of fresh ideas for you., we can help.